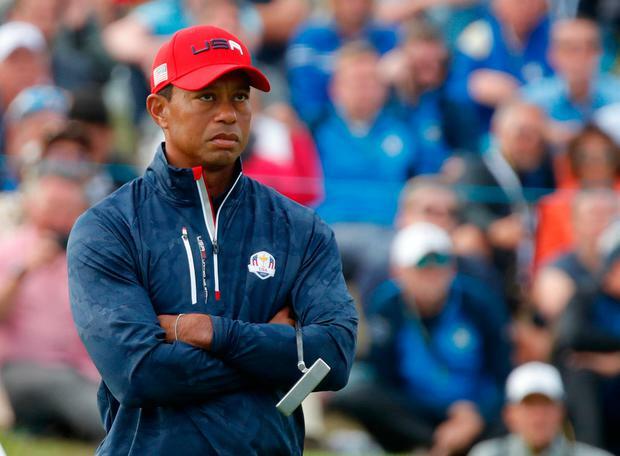 A despondent Tiger Woods admitted his recent exertions had taken their toll after he failed to win a single point in the United States' Ryder Cup defeat at Le Golf National. However, the 42-year-old lost all three pairs matches - making it eight in a row stretching back to 2010 - and his overall record now reads 13 wins, 21 defeats and three halved matches in eight appearances, only one of which (in 1999) has produced a victory. "Yeah, I played seven out of nine weeks because I qualified for Akron and you know, all of those are big events, starting with the Open Championship," said Woods, who lost 2&1 to Jon Rahm in Sunday's singles. "You've got a World Golf Championships, you've got another major championship, you've got the [FedEx Cup] play-offs and then you have the Ryder Cup on the back side. "So a lot of big events, and a lot of focus, a lot of energy goes into it. I was fortunate enough to have won one and we were all coming here on a high and feeling great about our games, about what we were doing, and excited about playing this week. "For me, it's been a lot of golf for a short period of time. I'll have a better understanding of what my training needs to be for next year so that I certainly can endure the entire season, because this year was very much up in the air of how much I would play or if I would play at all." Woods, who underwent spinal fusion surgery in April 2017 and only returned to action in November, added: "It's disappointing because I went 0-4 and that's four points to the European team. "And I'm one of the contributing factors to why we lost the cup, and it's not a lot of fun. It's frustrating because we came here, I thought we were all playing pretty well, and I just didn't perform at the level that I had been playing, and just got behind early in the matches and never got back."